Overall the weather has been quite mild this winter with spring grass already on the way. Our first calf was born February 9th. Almost all our calves will be born by the middle of March and hopefully be out on pasture by the end of March, weather permitting. I am looking forward to the lessened workload with the end of feeding hay till fall. The cows/calves are looking forward to the fresh green grass, no mud, and “romping” through the fields. 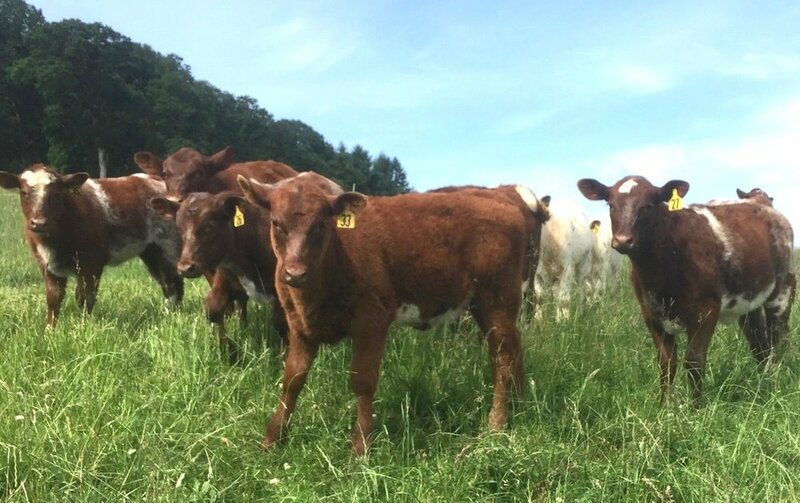 Many breeders of cattle, especially new or prospective breeders, are not familiar with the concept of “pedigree upgrading” and how a crossbred can be transformed into a purebred. The rules for accomplishing this maneuver vary from one cattle breed to another but essentially similar methodology is used. I will not go into the nuances each cattle breed utilizes to achieve the goal of producing a “new” purebred since the rationale and upgrading systems differ significantly. 1. Cattle Breed: A group of cattle that are linked historically and were developed through a specific selection process. They are uniform both phenotypically and genotypically. Simply put they look and function alike. 2. Purebred: An individual bred from parents of the same breed without commingling blood from other breeds. This term has been perverted by many cattle breed associations and today often indicates just a “percentage animal”. 3. Percentage Animal: It varies from breed to breed, but basically an animal could be less than 50% pure to 99.25% pure. It is a more accurate term than purebred because there is often an actual number placed on the degree of purity of the animal in question. 4. Fullblood: The individual has an unaltered ancestry and to the best of anyone’s knowledge is 100% pure. 5. Crossbred: An animal who has a blended ancestry. A good example is a Shorthorn Plus as they are part Shorthorn but have other breeds mixed in with them. They are often black because of Angus influence. 6. Composite Cattle: A planned breeding strategy where two or more breeds are joined together to utilize the the most desirable traits of each breed to produce a hopefully superior animal with specific characteristics. One illustration is the development of composite dairy cows (combining Holstein, Jersey, and Continental breeds such as Normandy Reds) to correct the reproductive, health, and longevity problems that currently plague Modern Dairy cows. 7. Upgraded Pedigree: The pedigree for an animal which several generations back included a crossbred but through successive generations of breeding to higher percentage animals or fullbloods of the same breed is now considered to be a “purebred” individual. 8. Heterosis: The likelihood that crossbreeding two individuals from different breeds will produce a superior animal that incorporates the best qualities of both parents. Also known as hybrid vigor. Most cattle breed associations have opened their herd books. Opening herd books allows breeders to introduce specific traits from another breed to enhance their own breed. For example: the introduction of Red and White Holstein genetics into Milking Shorthorns to increase milk production, and Maine Anjous into beef Shorthorns to produce thicker, larger beef Shorthorns. Unfortunately such tactics can be affected by the “rule of unintended consequences”. For Milking Shorthorns it has meant reduced longevity and certain genetic defects. In Beef Shorthorns it has meant increased calving difficulty, poor milk production, and new genetic defects such as Pulmonary Hypoplasia with Anasarca (PHA) and double muscling. For certain rare breeds of cattle upgrading is a necessity because they have such a narrow genetic base that inbreeding is causing major problems. However with many breeds, such as Shorthorns where there is broad genetic diversity, opening herd books and using crossbreeding is just a shortcut. Good cattle breeders can make changes within a particular breed through careful genetic mating of fullbloods without resorting to crossbreeding. There are several rationales used for upgrading pedigrees but most revolve around introducing new genetics into a breed to augment its genetic base, while still allowing breeders to market upgraded cattle as purebreds. This can be misleading since buyers may not be aware that they are actually buying a crossbred or percentage animal. The “genetic diversity” added to a breed by cross breeding may also bring undesirable traits. 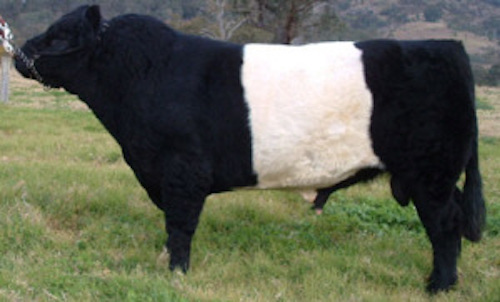 (Ever wonder where the white spots often seen in modern Black Angus came from?) Loss of the uniformity and homogeneity of a breed devalues and diminishes what makes it a unique breed. Ultimately this is really a loss for the cattle industry because the individual positive traits a specific breed has been noted for may no longer be “fixed” within that breed—i.e. will not be passed on in a crossbreeding/heterosis program used by a commercial cattle breeder. Regrettably this may not be apparent to buyers because the pedigree may have been upgraded, and the fact the animal is really a percentage animal is not listed on the registration paper. With some breeds an animal that is only 75% pure may be called a purebred. Anyone interested in breeding or utilizing “purebred” animals should investigate the definition of a “purebred” within that breed before investing both time and money. Everyone has to decide for themselves what buying a “purebred” means to them. I have no problem with crossbreeding in cattle and see it as a positive when it produces maximum heterosis and embellishes specific genetic traits. Many commercial cattlemen depend on crossbreeding to produce cattle that they can sell into specific markets. However I have never been a believer in the “upgrading” of pedigrees within a breed. If purebred breeders try to emulate other breeds then they loose the characteristics that made their breed special. The commercial dominance of Black Angus has certainly produced breed envy and caused several breeds to “turn black”. Many said they had to do it for survival. I say they did it because it was easier to follow than to lead. 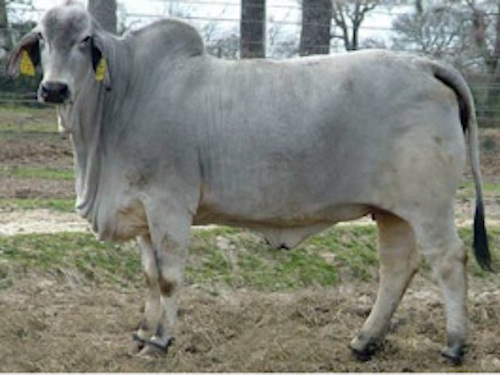 It is certainly possible to maintain different cattle lines—one of true purebred/fullblood cattle, and another of crossbred or composite cattle which are labeled as such. Perhaps with time there will be a continual melding of breeds (most likely gene editing will play a significant part in this) which will produce the ultimate composite commercial beef animal just as has happened with pigs, chickens, and turkeys, but just don’t call it a “purebred”. For my own cattle I am a true believer in the uniqueness of historical breeds and what they have to offer to the cattle industry. It is why I am involved in breeding Heritage Shorthorns that are fullblood—true purebreds.